Wellington City Councillors, while preparing budgets for the city’s long-term council plan, have recommended that they reduce the funding to Te Papa by 55 percent. Council will be asking for public submissions between 16 April and 18 May 2012 – and will be making their decisions on the submissions Wellington ratepayers make. If you would like us to keep everything, let us know. 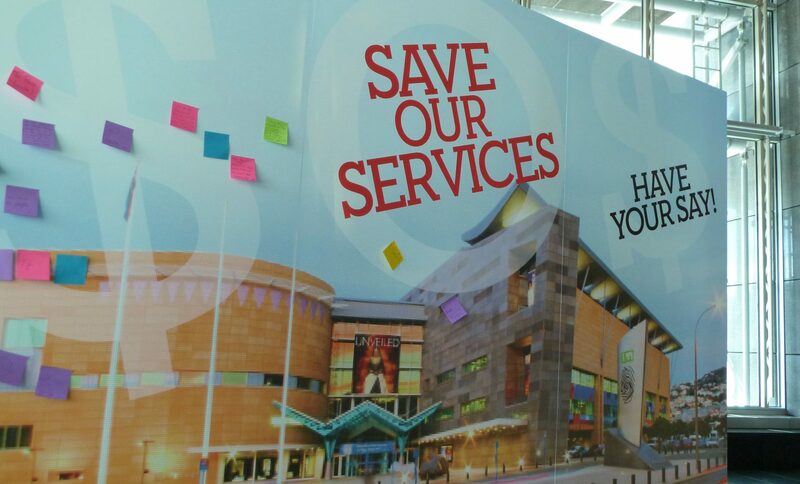 Come to the museum – We have a display near our information centre and we’re asking people to grab a sticky-note, tell us what you think we need to save! Te Papa is the most popular activity destination in Wellington City. 96% of our Wellington City visitors come back more than twice and 60% visit 5 or more times every year. Ever since our son was big enough to walk, Te Papa has been a favourite place to visit and explore. Exhibits and activities have captured his imagination and been revisited time and time again. Some days they were flying visits, others lasted hours. In this way he and hundreds, if not thousands, of other children assimilate their cultural, environmental, artistic and scientific heritage. Implementing any kind of access fee (even if only for accompanying adults) will impede this process. How could we (and the Wellington City Council) contemplate ripping off our kids in this way? We have also had many overseas visitors for whom the Te Papa visit was a very special experience and memory, precisely because there were no barriers to their wanderings (often repeated a second day) amongst the museum’s wealth of exhibits. Many explicitly commented how great it was that the entry to the museum was free. This is a huge signal that Te Papa/Wellington sends to New Zealanders and overseas visitors alike: we value our history and heritage so much we make it freely available to all. This is something to be truely proud of, and a legacy people will remember in the future. Thank you for your comments and your observations. As part of developing a ten year strategy and plan, Te Papa is looking at our previous performance, and what we want to be in the future. Part of this process is to evaluate what we have done well and what we could do better. This has been and will continue to be informed by discussions with our stakeholders, including staff and visitors, so thanks for taking the time to contribute. For the record, last year (2010/11) Te Papa spent 1.25% of its total operating spend on consultants. This is very low, especially when you take into account that many of these are suppliers for exhibition development. A great thing about having the art collection is that it provokes debate and discussion. Not everyone likes everything in the collection, but I’m sure that while you won’t like everything, you’ll certainly have some favourites here. We do try to collect across a range of art styles to keep everyone as happy as possible. The main issue here is the services we can provide to Wellingtonians if the recommendation to cut funding is approved in June. Hopefully, with the support of our visitors, researchers, mums and dads and other whanau, we can persuade them that it’s a great investment for the city. I’d cut some administration costs – Endless reviews paying out thousands of dollars to consultants is a waste of money that could be used to run the place. I know this from experience, as I worked there, and was restructured out of a job for these reasons, so I’m not simply creating scenarios from my imagination. This is a real issue, which is rampant at all levels of public institutions in NZ. TP could do well to use its prominence to buck the trend, and channel its funding to more productive ends. As the national art gallery, TP also has a responsibility to maintain a good collection of NZ art – Fine and dandy, I think we can all agree. However, the marketing game of the art world sees TP spending a lot (I personally think, far too much) on some very lazy and uninspiring works by “minimalist” or “conceptual” artists. A blank white canvas from Billy Apple is not art, it is a popularity contest, by deed if not by name. Plenty of fine, talented, imaginative, and hardworking artists are sidelined to showcase the poster children of the art world. TP is supposed to be a gallery for the people. Most people are not interested in an expose on the artists supposed portrayal of isolation in the contemporary urban landscape, or whatever buzzwords and cliches are tacked to a particular piece – They are interested in seeing something they enjoy, or can, of their own accord, place a social or cultural context to, without having to read an essay by the artist or a critic to do so. That side of the art world exists mainly for those in the business, but is wholly irrelevant to the majority of the public, to which TP rightfully exists to serve. NZ is teeming with brilliant artists, more of whom TP could support for less than they pay the celebrities. If the marketing game must be a part of the collection, then perhaps it could focus more on the diversity and potential of NZ art, not on the status of housing big names. Those artists can, and do, sell quite well in the private galleries. If they are truly interested in supporting TP as the country’s repository and representative of NZ art, then many of these artists or collectors, often of sound financial means, could loan or house some of their works there. No-one expects the artists to work for free, but squandering limited public funding on the name-game is not the answer. That is what private galleries exist for.